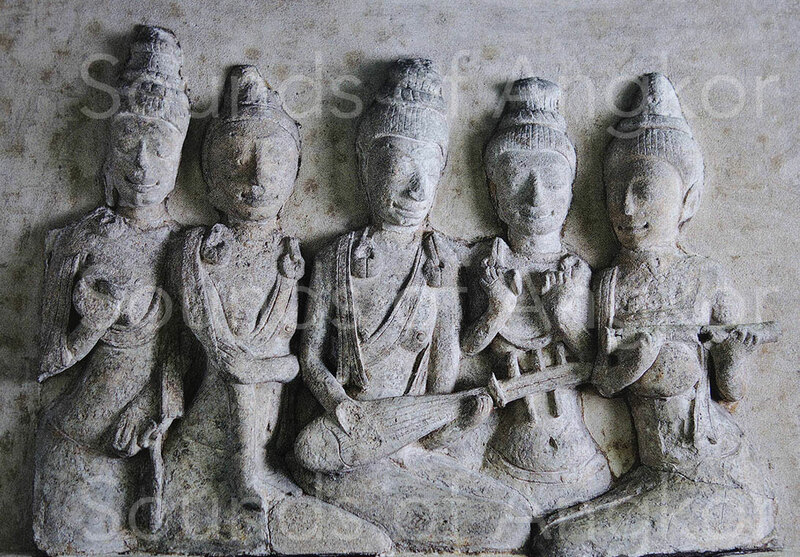 Lute - Site de soundsofangkor ! Although known in ancient India, no lute is represented in the Khmer iconography. However, two pre-Angkorian terms seem to refer to it: lāv and trisarī. The latter is probably a tricorded lute as the prefix of the word indicates. The instrument opposite has been reconstructed according to the epigraphy and iconography of Cambodia, Vietnam, Thailand and Java. Fragment of lintel from Pawaya. Madya Pradesh. India. Gupta Period 4th-5th century. 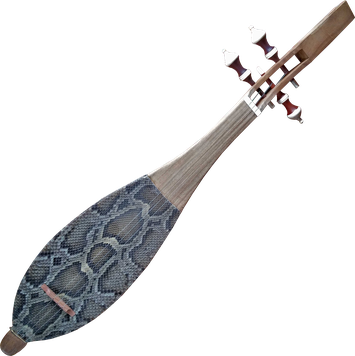 The pyriform lute existed in India during the Gupta period. 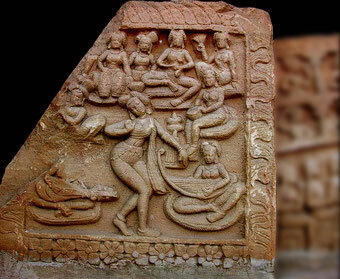 A few rare sculptures corroborate the Thai, Cham and Indonesian representations mentioned below. The lintel of Pawaya, visible at the Gujari Mahal Archeological Museum also known as the Gwalior Fort Archeologic Museum, shows clearly, at the bottom left, a lute with a pyriform sound box. The instruments which compose this orchestra are to be compared to the lists of instruments of the Lolei temple (9th century). Let us dare to compare the lists of donations of Lolei's inscriptions (K.324S & N, 327S & N, 330S & N, 331S & N) and the iconography of the same period in other territories: Thailand (picture 2), Vietnam (3), Borobudur - Java (1, 4, 5). All these lutes have in common a piriform or oblong-shape soundbox. They all from two to the five strings. In the lower register, from left to right: stick zither, tricorde lute, flute. Characters, whose hands and arms are concealed, may play instrumental duplications. Others have an undetermined role. In the upper register, from left to right: a cylindrical drum struck with two sticks, a cylindrical drum struck with a bare hand and a stick, a barrel drum carried and struck with bare hands, a large barrel drum placed horizontally and struck with bare hands, a pair of drums placed vertically (not played), two singers clapping in their hands. Same remarks as previously for the partially concealed characters. Lolei's staffing lists include percussion players, cymbals, zither, harps, lāv, trisarī, chko. 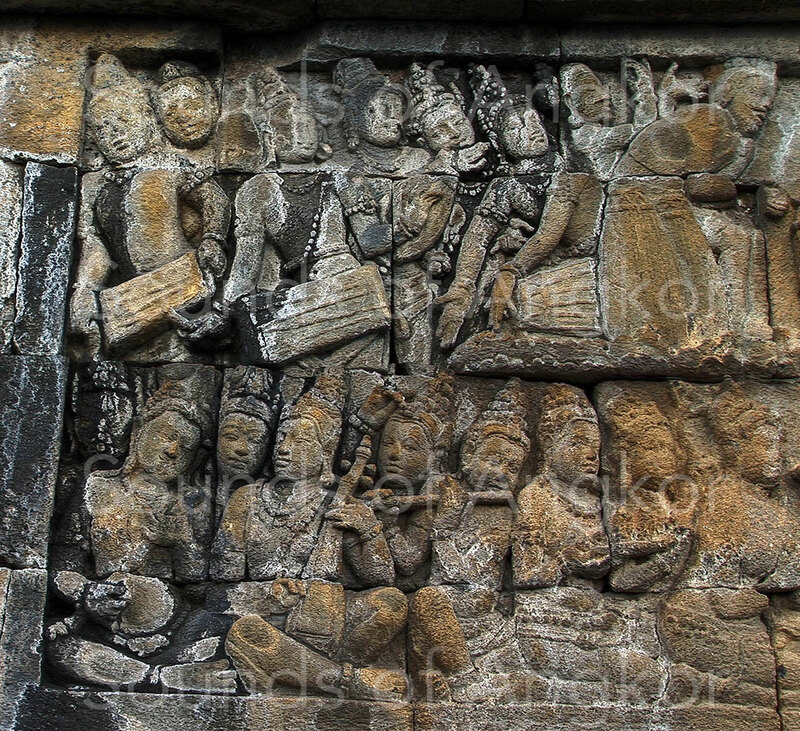 In this high-relief of Borobudur we find some of these instruments. The trichord lute could be trisari. The Cham high-relief shows a different instrument, but it also has three strings. The instrumental ensemble of Thailand (2) is composed of three instruments belonging to the list of Lolei, from right to left: zither, small cymbals, lute. As for the sculpture in photo 4, it presents a lute and a harp, instruments belonging to the list of Lolei. The zither seems to be made of the big bambou and a gourd resonator. It could be an idiochord zither like it still exists in Southeast Asia. It is tentatively concluded that between the 7th and 9th centuries the lute was played in the Hindu and Buddhist area of Southeast Asia. 2. Female musicians. Plaque excavated from a stupa at Site n°.10, Ku Bua, Ratchaburi. Second half of the 7th century Bangkok National Museum.